In recent times, news headlines have been dominated by falling stock market prices, low commodity prices and the risk of debt crises in many developing countries. Both the IMF and the World Bank have revised their global growth expectations for many countries downwards for this year, and declining GDP growth rates have particularly affected developing countries such as Nigeria. The sharp drop in global oil prices has had a particularly negative effect on Nigeria’s economy, a country heavily dependent on revenue from oil. It has become obvious that the county will be dragged into a recession if the diversification of the economy is not pursued aggressively. Other challenges hindering the growth of the economy include: the declining oil production in the Niger Delta due to the vandalisation of pipelines; the non-availability of forex to boost the importation of raw materials for Nigeria’s industries; and the consequent reluctance of foreign investors to venture into the market. One of the major challenges affecting Nigeria, and the majority of developing countries, is that of poverty. 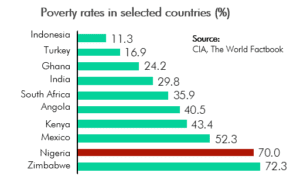 When compared with other countries like Turkey and Mexico, and even other Sub-Saharan African countries such as South Africa, Kenya and Angola, the percentage of the Nigerian population that falls below the poverty line is extremely high, comprising about 70% of the populace (Figure 1). In order to address these highlighted challenges, the Federal Government (FG) has placed an increased focus on agriculture, health and education, as the most critical sectors to tackle issues related to food security, job creation and disease eradication. To kick-start this transformation, the FG has allocated N500 billion for social welfare intervention programmes for 20161, which will include conditional cash transfers to the poorest and most vulnerable Nigerians. The focus of this report is on food security, because food is essential to societal well being and economic productivity. The result of a food security assessment provides a useful representation of the demographic, social and economic status of a country at any given time.